This is a one-of-a-kind recording of a strange work. The lurid legend of Saint Sebastian, the beautiful young man who spurned the advances of Emperor Diocletian and was summarily tied to a tree and executed by a firing squad of archers, has attracted the more prurient attentions of artists for centuries. When Claude Debussy and writer Gabriele d'Annunzio decided to present the myth in a gigantic, five-hour multimedia extravaganza with singing, recitation, mime and dance, something weird was bound to happen. Two weeks before the premiere, the Vatican banned D'Annunzio's works, and the Archbishop of Paris forbid Catholics from attending. 'Le Martyre de Saint Sebastian' was a tremendous flop, has not been staged since and is only heard in various fragmentary forms which reveal some of Debussy's more interesting and forward-looking music. 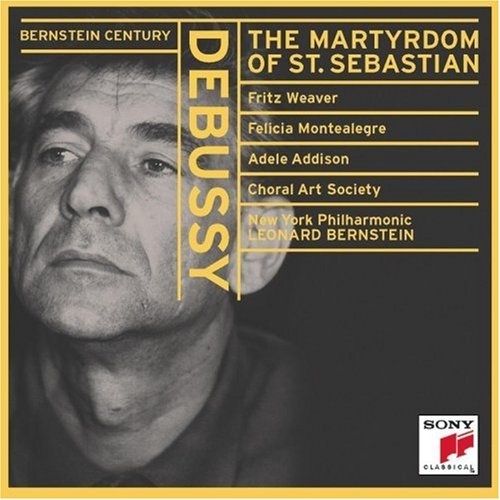 This disc contains an oratorio treatment with translation by Leonard Bernstein himself and the spoken part of the Saint taken by Bernstein's wife, Felicia Montelegre. Prologue: "Gentle People, We Bid You Silence..."
"First Window, The Court Of Lillies"
"Glory! Glory to Christ The King"
"And Suddenly A New Voice Sings From Beyond the Magic Door"
"Caesar, I Refuse Your Lyre..."
"Who Is This Young Man So White..."
"He Dies, The Archer Of Lebanon." "But Gentle People...Fourth Window, The Wounded Laurel." "I Feel In The Palm Of My Hand The Stigmata Burn..."
"From The Depths, Archers, I Call Upon Your Love!" "A Pearly Radiance Spreads In The Sky...The Fifth Window, Paradise!"